Century-old Tusher diversion dam, damaged in high flows of 2011, is a hazard to fish and rafts. 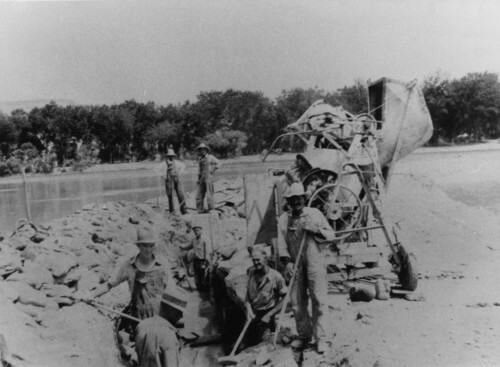 Workers in the early 20th century repair the Tusher diversion, a century-old low-head dam on the Green River that high water damaged two years ago. The federal Natural Resources Conservation Service is studying whether to repair or replace this historic structure, while the boating community hopes whatever is done, the job includes boat passage. This weir, just upstream from the town of Green River, is the only obstruction to boating on the river below Flaming Gorge Dam. Photo courtesy of Marriott Library, Special Collections, University of Utah. 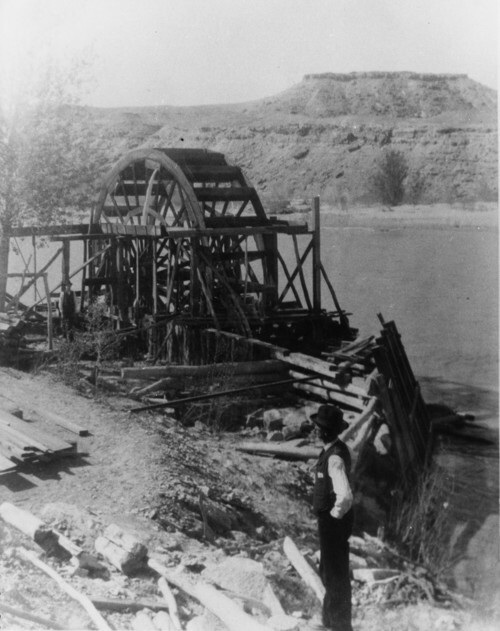 This water wheel, pictured here in the early 20th century, still stands at the Green River's Tusher diversion, which federal officials are to repair or replace this year. An ongoing environmental analysis must consider the structure's cultural values. Photo courtesy of Marriott Library, Special Collections, University of Utah. High water damaged a century-old low-head dam across the Green River near its namesake Utah town two years ago, imperiling the water source for the Gunnison Valley and its famous melons. As the federal government prepares to repair, remove or replace the Tusher diversion dam, recreational interests are now insisting the solution include boat passage. The dam, known as a curved ogee weir, is the only man-made obstruction to boating on the ever-popular Green below Flaming Gorge Dam. Those who row rafts and dories over it risk damaging their crafts as they scrape down the backside and then piling up against rebar and chunks of concrete just downstream. Longtime river guide Richard Quist recalled rescuing some fishermen who upset their boat going over the dam and became stranded on an island downstream. He won&apos;t name names, but he knows of many river runners who have gotten boats stuck on it in foolish attempts to run the dam in low water. "I&apos;ve run the dam three times, and each time there was some trouble or near-disaster," said author and river runner Roy Webb. "I&apos;m very concerned that this project will block boat access, create a public nuisance that could lead to the loss of lives, and stifle a thriving river outfitting business. Locals, tourists and scientists use this stretch of river on a regular basis," he wrote in comments on the project to the federal Natural Resources Conservation Service (NRCS). Meanwhile, the NRCS has decided a full Environmental Impact Statement is in order because the dam is eligible for listing on the National Register of Historic Places. That will push back the $3.5 million project by a year, with construction expected to begin around summer 2014. No decision has been made on whether to include boat passage, officials say. "We will restore what&apos;s there and make a solid attempt to make it better," project engineer Bronson Smart said. "We might not be able to build a kayak park but we will make it better for passing fish." He called the weir a "one-of-a-kind" structure for Utah, built in 1906 from cottonwood trees that were lashed together in a crib then filled with rocks. The structure&apos;s arc faces the current and it has since been capped with a concrete slab. "The timbers don&apos;t dry out so they never rot. The water has eroded the downstream side of so it has exposed some the wooden structure," Smart said. "I don&apos;t know how they built it without diverting the water. It&apos;s fascinating to me that it was built so long ago and it&apos;s still standing." But after 105 years, it apparently did not take much to damage it following the wet spring of 2011. The peak flow that year, 43,700 cubic feet per second, was nowhere near a 100-year event, according to comments supplied by the Moab-based group Living Rivers. The dam had endured much bigger flows in the past and the Green experienced even more powerful flows in the 19th century in excess of 100,000 cfs. If it has to be refurbished using public money, the project should accommodate interests that did not get much consideration 100 years ago, say environmental and recreational advocates like Herm Hoops, a former National Park Service naturalist who is now a river guide. The dam is located three miles below Swasey&apos;s Beach, where those rafting the Labyrinth often take out, and eight miles above the put-in at Green River State Park. That stretch would be ideal for an easy day trip by canoe and make the park a more attractive destination if it could be paddled. "We are seeing a lot of communities wanting to reclaim these single-purpose structures to expand the economics. Having more people boating the Green River would be a benefit to the city," said Jason Carey, an engineer with the Colorado firm River Restoration. "It is not unreasonable to have safe boating and great melons in Green River." Carey believes the engineering to enable boat passage would not be difficult and has been pulled off on old low-head dams obstructing other rivers. Last year&apos;s renovation of the Hartland Dam, on the Gunnison River near Delta, Colo., offers an example. Under an emergency watershed protection program, NRCS is to cover 75 percent of the Tusher project&apos;s cost and the water users will cover the remaining share. But funding for making the dam friendly to fish and boaters is not so clear. The U.S. Fish and Wildlife Service is expected to pay for installing electric fencing at the raceway intakes to keep fish out of the hydro turbines and irrigation canals where they wind up fertilizing melon and alfalfa fields. Such a feature could help keep three threatened species of native fish  bluehead sucker, flannelmouth sucker and roundtail chub  off the endangered list.